High in carbon, brown materials like dry leaves are an essential part of your compost recipe. Autumn is a great time to gather these sometimes-scarce materials so you can maintain the proper balance for an outdoor compost pile through the winter into next spring and summer. So where can you find them? Dead leaves are common in the fall, but that's only a few months of the year! Collect leaves now, while you have the chance. Ask your local park if you can gather leaves for your compost pile, or have some fun by holding a leaf-raking or leaf-drop event with your neighbors. 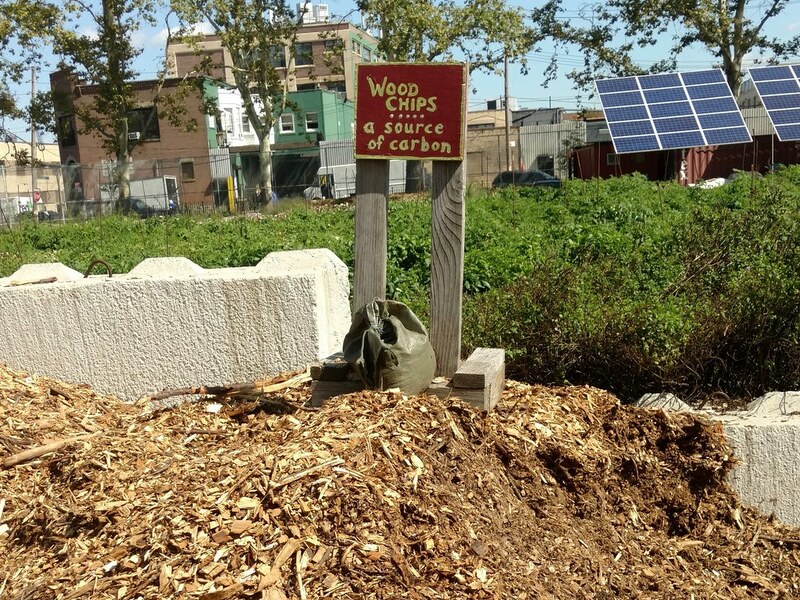 Community compost sites can contact us at the NYC Compost Project, and we will mow leaves to help them break down easier in the compost. Another option: Build a huge pile and let the kids jump on them! To preserve their high carbon content, store your leaves in bags or bins where they will stay dry. Then add them to your compost pile as needed throughout the coming months. Collect leaves from paved areas, grassy and mulched areas, or right after they have fallen to avoid getting trash mixed in and to minimize the risk of soil contaminants being absorbed. There are other browns you can collect in Brooklyn, including cocoa bean hulls, coffee chaff, sawdust, wood shavings, wood chips, and straw or hay. Your local coffee roaster may be willing to let you have its coffee chaff, the dried skin on a coffee bean that comes off during the roasting process. Similarly, a chocolate maker may donate cocoa bean hulls. Lumber yards and woodshops may let you take sawdust or wood shavings off their hands. Just avoid any that come from pressure-treated wood or wood treated with chemicals like creosote, CCA, and PCP. Also avoid woods with natural allelochemicals, like black walnut. Such chemicals can make their way into the compost and stunt the growth of the plants you place it near. Stables, farms, and even some nurseries might have straw or hay to pass along. These are two great browns—just watch out for weed seeds in hay. Also make sure the material hasn't been treated with chemicals such as pesticides. Wood chips make good browns, although they will take a long time to break down. Ask local tree service companies, parks, or cemeteries if they have chipped wood to give away, and watch for MulchFest holiday tree–mulching events at city parks in January. Cardboard or newspaper can be a secondary supplement to your browns supply. Tear it up and add only a small quantity at a time so that it doesn’t clump as it absorbs moisture. You can also leave your garden trimmings to dry in the sun and then toss those in as carbon-rich material. Support your park and access some carbon-rich browns by raking leaves at Leaf Crunch. We’ll compost the leaves and donate the finished material to interested volunteers and local greening projects. Saturday, November 18, 10 a.m.–1 p.m., Brower Park, Park Place at Kingston Avenue, in Brooklyn. Wood chips are another carbon-rich material for compost. Photo by Aaron Lee.